How to make a monster hit. In truth we don’t really know why things work, why some ideas soar and others never reach lift off. In media too often the winners get described as ‘going viral’ the idea that these ideas get passed from person to person and organically grow. Derek Thompson, who looks about 20 years old (he made both Inc. & Forbe’s Magazine’s – 30 under 30 lists), and is now Editor at The Atlantic Magazine, has done some serious research. There’s numerous revealing insights in the book, but the main theme is there’s no such thing as ‘going viral’. 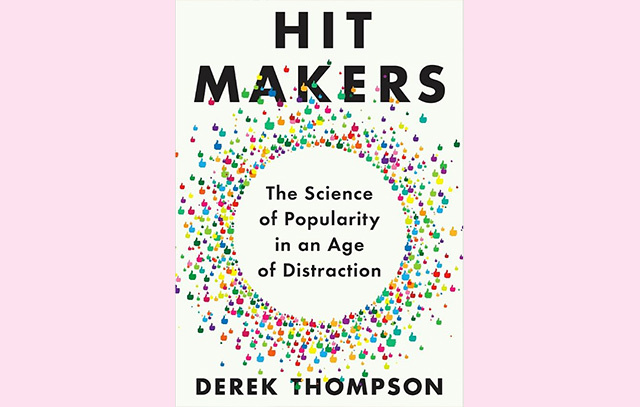 Thompson points to dozens of examples going back to the impressionist painter Monet, to more recently Fifty Shades of Grey, and even our very own Lorde to prove that all these ‘hits’ in fact had a big bang broadcast moment. Whether it’s Super Bowl, or a bequest to the Louvre Museum, or in Lorde’s case – whose song Royals featured on a playlist Sean Parker (Napster / Facebook fame) put together, there was a major broadcast moment that kicked it all off. Thompson also looks at what makes for a great product and argues that most people are simultaneously ‘neophilic’ - curious to discover new things – and ‘neophobic’ - afraid of anything that’s too new. The best products marry the old with the new – they create familiar surprises. Locally, Lewis Road Creamery is a really good example of this – the familiarity of New Zealand’s favourite chocolate, but in a completely new format. It was a familiar surprise. When you look around, you see this being played out everywhere. In fifteen of the last sixteen years, the highest grossing movie in America has been a sequel of a previously successful movie (e.g.. Star Wars) or an adaption of a previously successful book (e.g.. The Grinch). To sell the familiar make it surprising, to sell something surprising make it familiar. Lots of amazing little anecdotes – how Rock Around the Clock was a nothing song for years until a kid recommended it for a movie soundtrack, how Adele’s enormously successful album was a sure thing based on software analysis of the melody, and how Twitter messages aren’t shared at all 90% of the time. Only about 1% of all Twitter messages are shared more than seven times. The main out take for me is the importance of exposure. Popularity of messaging on the internet is driven by the size of the largest broadcast – whether that’s a media outlet, or a celeb, or just an ad buy. Digital block busters aren’t about a million one to one moments as much as they are about one to one million moments. Scale & exposure still rules.